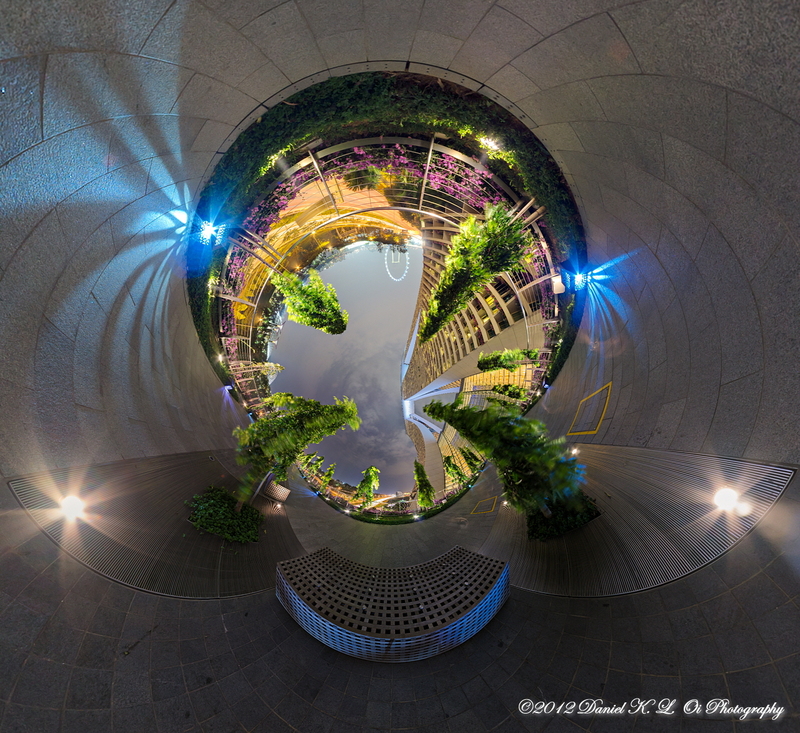 I am pleased that my Singapore Esplanade panorama was highlighted on the 360Cities Blog. This was a challenging pano to take due to a number of factors. A night pano often has extreme contrast due to bright lights along with the dark night sky. 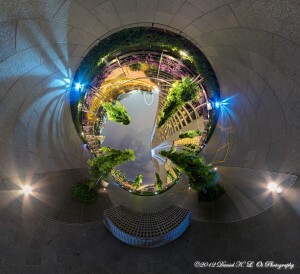 I decided to take the pano from the obvious spot of symmetry which was on top of a rounded bollard. To make things even trickier, I had a couple sitting close by which I had work around. The most difficult part of taking and assembling the pano was the nadir shot. In fact, there is a slight misalignment between the nadir shot and the rest of the pano leading to some parallax in the parts where the chain joins the bollard but I hope that it isn’t too noticeable. The alternative would have been a mirrorball to hide the nadir but that would have been a cop-out. 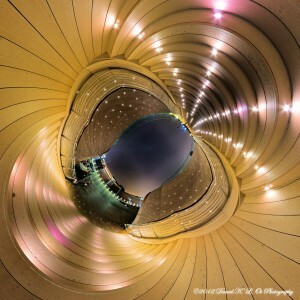 I have been lucky enough to have several of my panoramas selected as an Editor’s Pick at 360cities.net. The latest was one I took last year and only got around to assembling recently. 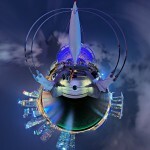 I had made a similar panorama at the time but it didn’t make it as an Editor’s Pick. This pano was challenging because of the lighting. The fountains would change colour very frequently. Add in the movement of the crowd, it meant that I had to double the amount of shots to take in order to make sure I would have a seamless result. Instead of 4 shots in the horizontal plane, I took 8. I also took 2 of the zenith as the colour was changing. As each exposure was 30 seconds plus the same again for dark frame subtraction, this meant standing around for some time. I managed to find a spot in the middle of the fountain where I wouldn’t be hit with any water. I timed my shots to capture the variety of colours lighting up the fountain. These were blended together in Hugin using masks. The final result was then exported as an equirectangular pano for upload, but I also played around with the Little Planet project you can see above. I’ve returned from a business trip to Singapore. There’s always something new to explore every time I visit. On this trip it was Marina Bay Sands and Gardens by the Bay right next door. Marina Bay Sands (pano) has been open for some time now but this was my first visit to the complex. It is an impressive are with lots of interesting shapes and sights. I was not able to have a look into the main attraction which is the casino, but I prefer to spend my money on photography rather than gambling. 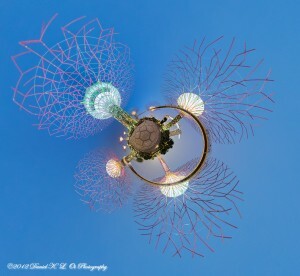 Next door is Gardens by the Bay, a newly opened botanical garden. 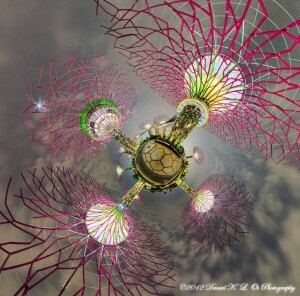 The most noticeable landmarks are the so-called Super Trees, artificial constructs which house plants on its sides and serve a host of functions. When the sun descends, they are lit up with a son et lumiere show. The weather in Singapore is humid and often with cloud cover. This makes landscape shots during the day often flat and uninspiring. A reconnaissance visit during the did not lead to anything worth showing but as evening approaches, interesting colours start to appear in the sky. The time around sunset is known as the Golden Hour. In Singapore one degree North of the Equator, the period where the sky is evenly balanced (pano) against the ground is considerable less than hour (during the summer in Scotland, it can be several hours long, that is if it isn’t cloudy or raining). I had to be quick to catch the light, starting to take photos just as the sun was setting and continuing into the dark. Since the light is often mixed and tinted, there’s no “right” white balance so you are free to choose an overall tint which complements the subject matter. When all natural light has gone from the sky, you are often left with city glow, at least in urban areas. This can be mix of sodium lamps, fluorescent lighting, and HID. It can reflect off clouds which in some cases lends some interest to otherwise featureless sky (unless you are blessed with minimal light pollution and can pick out the Milky Way). Here (pano) you can see the change in the tint of the sky. clouds came in and gave some texture to the sky. There is considerable city glow, not surprising in a built-up urbanised area light Singapore. Another place I was able to explore a bit was the Sentosa Boardwalk which connects mainland Singapore to Sentosa Island to the South. This nice stroll has botanical displays along its length but also has several establishments in the middle and a lookout point from which you can see the cable car from Mt Faber to Sentosa. Here (pano), I’ve taken a pano from the stairs leading from the top path down to the lower deck. It was fairly dark, exposures being 30s at f/8 ISO100. The NEX-7 has tremendous dynamic range allowing me to pull out a lot of shadow detail. The shot below (pano) is the view from the deck showing the cable car, Resorts World Sentosa, and the city in the distance. There were a few other tourist soaking up the view. 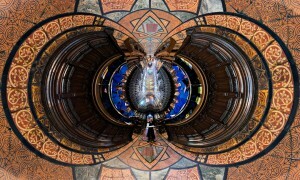 I’ve been going over my back catalogue of unstitched panoramas. These are mostly one which I didn’t have time to assemble at the time, or were lesser priority than other ones. However, this one was challenging to stitch due to the combination of lots of moving objects and the need to take a bracketed exposure for the sky, and I have waited nearly three years before attempting it. My post-process has improved and the tools I use have also advanced which means that I can now more easily assemble difficult panoramas. The panorama was taken on a visit to Paris in July 2009. It was a lovely summer’s day, sunny but not too hot. The sunset was not going to be too spectacular so I decided to wander around to soak up the ambiance. 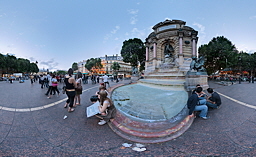 The Fontaine Saint-Michel is a noted meeting spot for young and old. It had a lively atmosphere so I hung around and set up my tripod. The people near me didn’t seem to have a problem with it so I quickly took a series of shots, especially trying to capture the moving people and allow me latitude during assembly. I knew at the time that it would be tricky to blend together the shots without cutting people in half. I had many other panoramas to stitch from the trip and I concentrated on the low lying fruit. Waiting three years to attempt this has paid dividends. The masking tools in Hugin and the RAW development in Lightroom 4 have improved immensely. With lots of masking, I was able to assemble a near seamless panorama, and the highlight recovery tool was able to bring down the highlights which helped blend bracketed exposures. Enfuse was then used to exposure fuse three renderings of the scene to adaptively compress the dynamic range into something which looks naturalistic. 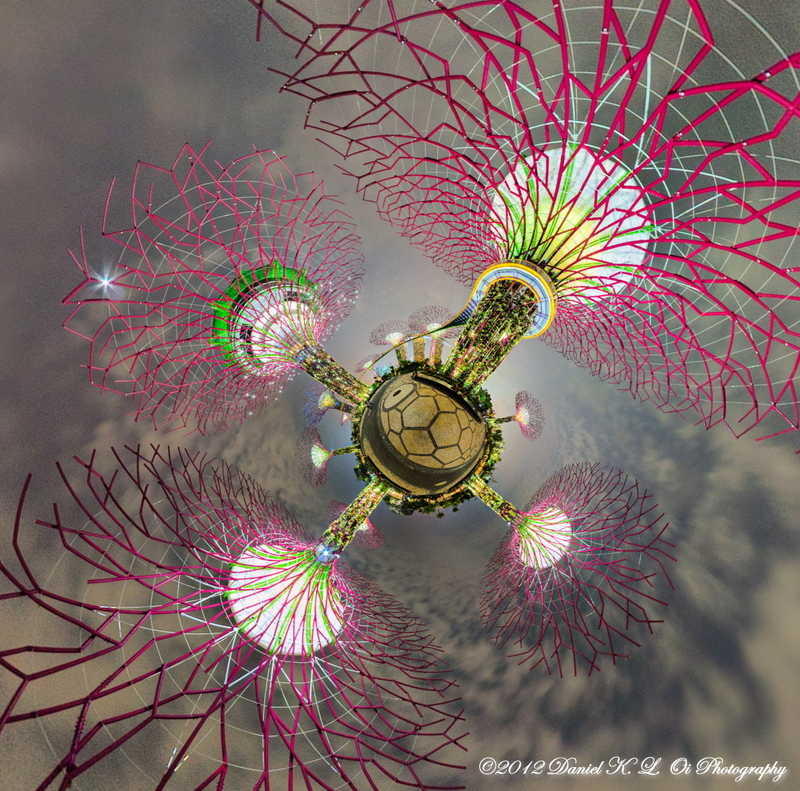 I was able to assemble all the elements within Hugin itself without the need to use Photoshop to blend layers, clone or mask elements after stitching. I did my usual post-processing in Picture Windows Pro 6, levels, curves, large-radius sharpening, detail sharpening, and a few colour tweaks. I’m slowly going through photos which I took during a recent visit to Singapore. The Marina Bay area is quite colourful at night when the CBD and the new casino development are lit up. 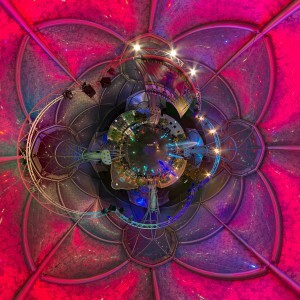 Night panoramas can be quite challenging, especially when coupled with lots of people moving around. The hot conditions also increases the dark current of digital sensors meaning that dark frame subtraction is a must on long exposures. It can take several minutes, maybe half an hour to get the photos for a single pano depending on how many shots are required to avoid people being cut in half. The Merlion is an icon of Singapore, the one on Marina Bay shooting a geyser of water from its mouth a crowded tourist sport. 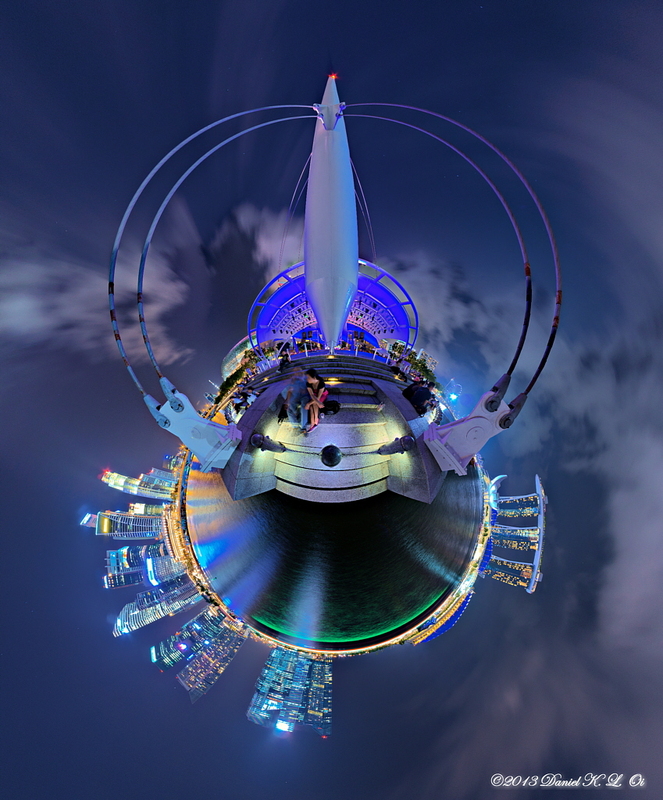 This pano also surveys the bay with Marina Bay Sands Hotel and Casino opposite. Tourists and locals soak up the balmy evening air. I have just returned from a weekend in Chester, an old walled town dating from Roman times. The cathedral is a beautiful building, especially the tiles on the floor and the vaulted ceiling. 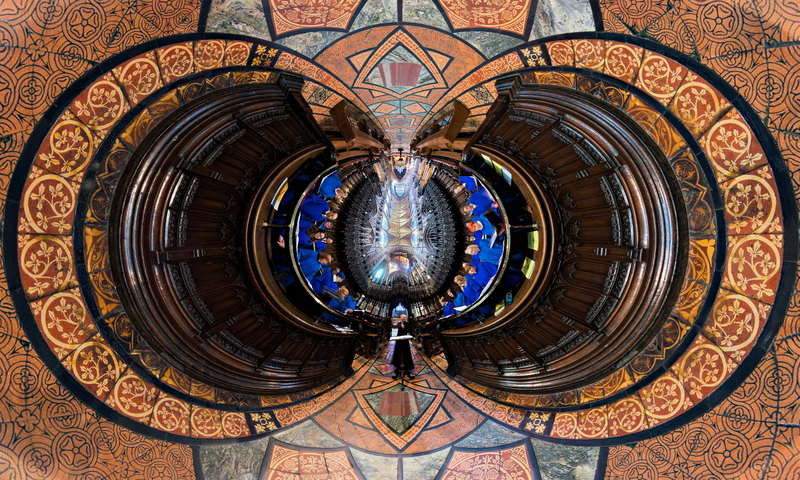 I took a panorama of the Strathclyde University Chamber Choir rehearsing for Evensong. To obtain the image on the left, I remapped the spherical panorama, which was in equirectangular format, to a stereographic projection. The tiled patterns form interesting geometric shapes. I recently returned from Brussels where I was able to take a few panoramas. Brussels is sometimes called a mini-Paris, I found it pleasant enough. The weather was a bit dreary for most of the time I was there so it was best to take photos in the evening where the grey sky does not intrude. The last day was clear and sunny, though very chilly, so I managed to capture a brighter looking Brussels. The Grand Place is a usual tourist sight so no surprises here. The “square” is 68m by 110m and is dominated on one side by the Town Hall and the Royal House on the other. It dates from the 10th or 11th century and is now a UNESCO World Heritage site. The Jardin du Monts des Arts lies beyond the Central Station and is colourfully lit up at night. There was a busker who was very pleasantly playing the saxaphone and the flute which made the ordeal of standing around in freezing weather a little bit more tolerable. Here’s a view (360 degree pano) from a little bit further up the hill. Heading further East, we get to the Place Royal. The church of St Jacques du Coudenburg is on one side of the square. 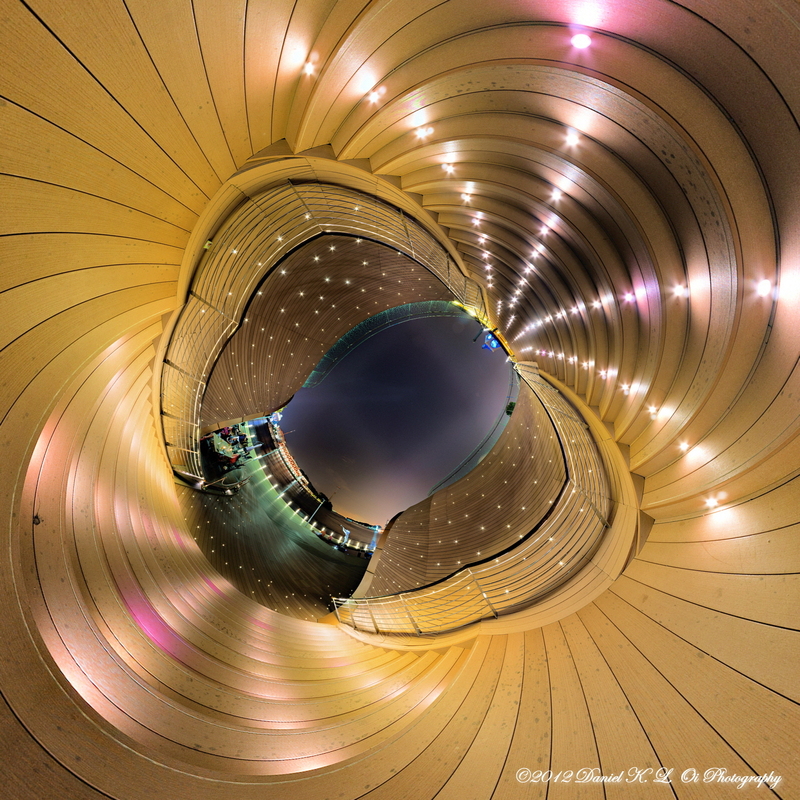 The interior (360 degree pano) is fairly restrained but still beautiful. On my last day, I was able to catch Brussels in sun. The Royal Palace has a nice garden at its front. There were some bored looking guards standing in huts, probably wondering what this strange person with a funny looking camera/tripod was doing.